Finding the best men's hiking sandals isn’t easy because there are so many different styles out there. From simple strapped designs to those that could almost be classified as hiking shoes, we looked at them all. We spent a lot of time looking at the best-selling, highest-rated options out there to put together this guide to help you find the right fit. Before we get started, let’s take a look at some of the main features to keep in mind while you shop. 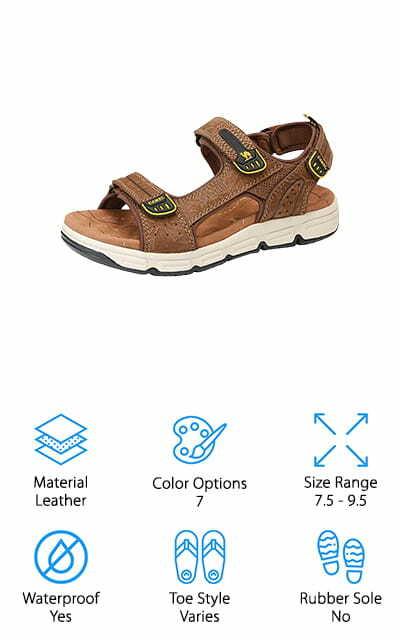 Material: These sandals come in a wide range of materials including leather, textile, polyester, and various synthetic materials. No material is better than the other but keep in mind that comfort and durability are important with these shoes. Color Options: Color options vary from one product to another. Some of our picks only come with 1 or 2 different options though we found one with 16. Most of the designs are pretty muted but you will find some bright pops of color. Size Range: There’s something for everyone on our list. Each sandal comes in a different range of sizes but, overall, we found shoes for everyone from a size 6 all the way up to a size 17. Waterproof: We found a few waterproof options while some are not but dry really quickly. Bear in mind that these are sandals so, even if the shoe isn’t affected by water, your foot will still get wet. Toe Style: There’s a nice mix of open and closed styles on our list. 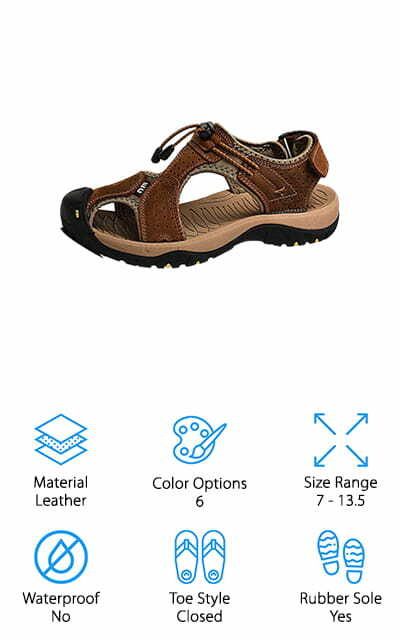 Open sandals are comfortable and great for streams and beaches while closed toe sandals give your toes a little bit of protection to stay safe on the trails. Rubber Sole: Most of these shoes have rubber soles which are great for walking along any terrain. Some have rugged outsoles more suited to off-road adventures while others are flexible and perfect for hiking along rocks at the river. Now that you know a little more about what to look for, let’s move into our reviews. If you’re in a hurry, the best place to start is right at the beginning. There, you’ll find our top and budget picks which gives you an idea of the range that’s available out there. We found a lot of different styles, though, so stick around as long as you can so you get a good look at all of them. What are the best hiking sandals? Let’s find out. Our top pick is the ECCO Men’s Yucatan Sandal, a great pair of backpacking sandals that feature an open-toe sporty design while still providing a decent amount of coverage and protection for your foot. There are 3 straps in all with hook-and-loop closures, one on the toes and at the top of the foot and one around the back of the ankle. That gives you a lot of control over fit. A stretchy underlay and rubber sole provide flex and grip on any terrain. Plus, the dual-density covered footbed helps inhibit bacteria growth and eliminate odors. Overall, the lightweight design is just really comfortable and durable enough for your outdoor adventures. Plus, they come in a wide range of sizes and there are 16 different colors to choose from. 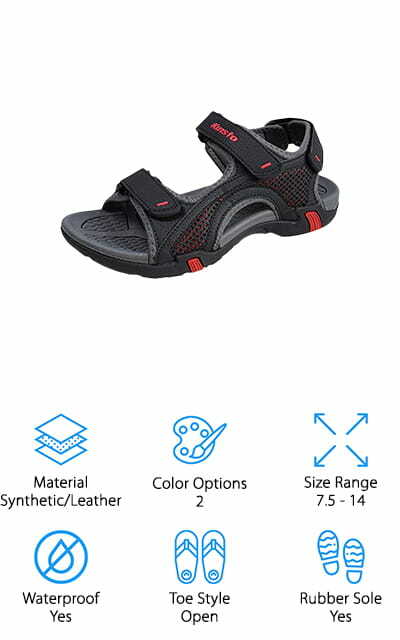 If you’re looking for an inexpensive pair of reliable sandals, take a look at our budget pick, the Teva Men’s Hurricane sandal. This is a classic design that features simply nylon straps and a lugged outsole that’s extremely durable and provides excellent traction. There’s also an EVA midsole that provides lightweight cushioning and a nylon shank for the additional stability when hiking on uneven terrain. That’s not all, the footbed also has a Microban zinc-based antimicrobial treatment that helps prevent any strong odors. The fit is adjustable, too, with the 3 adjustable points that you can tighten using simple hook-and-loop closures. These sandals are available in sizes 7 to 16 and there are 9 different colors to choose from including basic solid colors as well as some fun patterns for a bit of style. 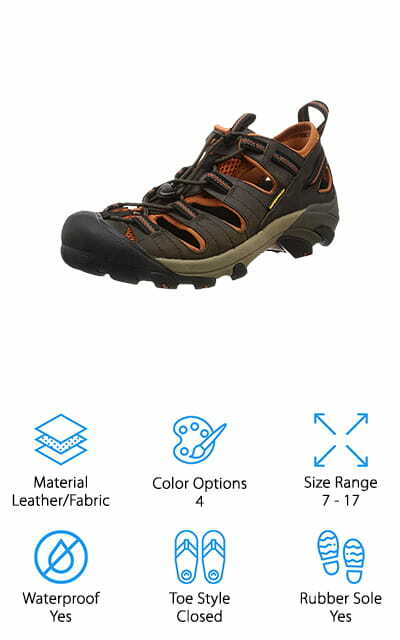 KEEN Men’s Arroyo II Sandals are ideal trail sandals that are the perfect blend of a sandal and standard hiking shoe. What do we mean by that? They’re open and airy while still proving your foot with a decent amount of coverage. A bungee lacing system and pull-on loop make it simple to get them on and adjusted to the right fit. There’s also a rubber toe cap for protection against rocks and twigs to keep your toes safe and protected on the trail. The hydrophobic mesh lining and waterproof leather uppers are great for splashing through streams or inclement weather and the durable rubber sole feature multidirectional lugs to keep you on your feet in any terrain. This sandal is available in sizes from 7 all the way up to 17. 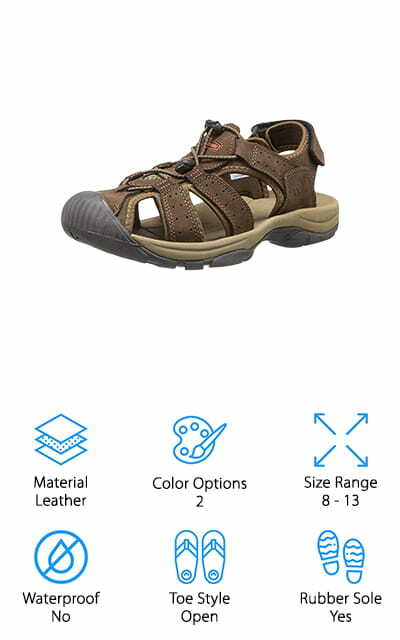 Our next hiking sandals are the Kunstro Men’s Sandal. These sandals feature a simple design that not only looks great, it’s also perfect for the outdoors. The lightweight synthetic and leather upper is breathable and quick-drying so it’s great for walking along beaches and streams. They also feature rubber soles with specially designed tread patterns that make these the perfect sandals for exploring off-road. 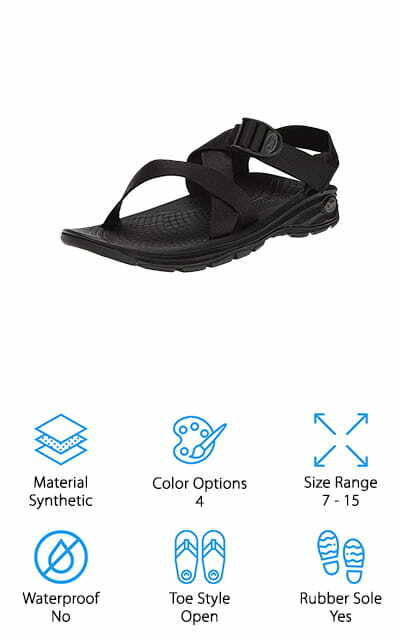 Not only do these sandals have a surprising amount of comfortable arch support, but the adjustable triple hook-and-loop straps also help you get the perfect fit. There are 2 different color options available, black with red accents and gray with black accents. Each features side mesh with a contrasting underlay for a little pop of style and color. 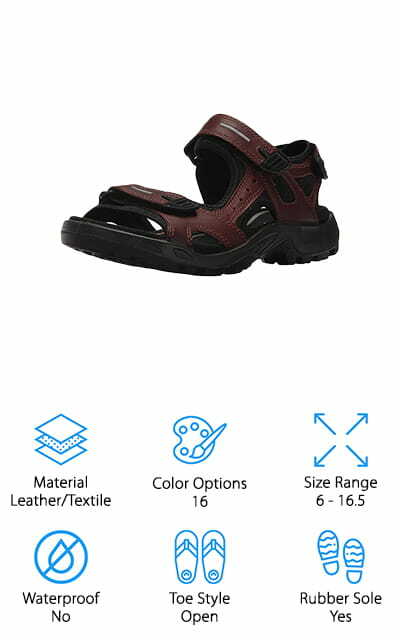 These sandals are available in sizes 7.5 to 14. Another great pair of top hiking sandals with a really simple design is the Chaco Men’s Zvolv Sandal. They have a casual look that’s appropriate for daily wear but are also packed with features that make them great for exploring the great outdoors. The Luvseat platform contours to your foot and provides arch support while the lightweight PU midsole resists compression and wear for durable long-lasting tread. That’s not all, the EcoTread outsole is made using 25% recycled rubber compound and has 3mm thick lugs for excellent traction. Getting the right fit is easy, too, with the adjustable straps and buckle. That’s not all, the straps are made of jacquard webbing that dries quickly for added convenience. There are 4 different styles to choose from. A few even feature patterned strips that add a pop of color. The Salomon Evasion Cabrio Sandal is a great pair of durable sandals if you want something that provides a little more coverage than a strappy sandal. Okay, they actually give you a lot more coverage. These shoes feature mesh overlays, a bungee closure, and an adjustable heel strap for a comfortable fit that’s secure without being too snug. The midsole provides excellent grip and cushioning and, while they’re not technically waterproof, the fast-drying synthetic upper dries quickly which makes these shoes suitable for hiking around streams or when trying to make your way around in wet weather. These shoes are a good balance of sneaker and sandal, protecting your foot and providing amazing grip while remaining light and airy enough for breathability and comfort. This style is available in sizes 7.5 to 12.5. Next up is a great pick from a popular and well-known brand. The New Balance Appalachian Sandal is a perfect balance of sandal and hiking shoe. Why do we say that? Because the closed-toe design provides protection for your foot while the side vents keep the shoe open and airy enough to provide superior breathability. While they’re not waterproof, they do dry very quickly so they’re great for any outdoor exploring. The fixed backstrap keeps the shoe in place while the stretchy bungee lacing allows you to make the proper adjustments for the perfect fit. Plus, the durable outsole and rubber toe bumper keep your foot from any rocks or twigs while providing excellent grip for the trail. These shoes are available in sized 8 to 16 and come in 3 different color schemes. For a hiking sneaker that’s also stylish enough to wear out and about every day, take a look at the CAMEL CROWN Leather Sandals. The first layer of high-quality leather is soft and comfortable against your foot and won’t rub or chafe your skin. That’s not all, there are matching elastic fabric accents, too. The sole is covered with microfiber leather that’s super soft and comfortable. It also has imitation acupuncture points that massage your feet as you hike. A durable polyurethane sole features a specially designed tread pattern that delivers excellent grip in a variety of terrain. These shoes are available in 7 different colors and a few different styles, including two strap designs and one that actually features a closed toe. Some have a sportier look than others but they all perform well outdoors. Another great pair of sporty sandals is the Northside Trinidad Sport Sandal. They feature a 100% leather upper with perforations to promote airflow. The leather material is durable and pliable so it molds to your foot over time. That’s not all, there’s also a bungee cord vamp that’s easy to adjust and a hook-and-loop backstrap to make the adjustments you need to get the perfect fit. There’s an EVA midsole inside that’s adds cushioning support plus toe guards and a durable sole for traction during outdoor adventures on any terrain. These shoes are not waterproof but they do dry very quickly. 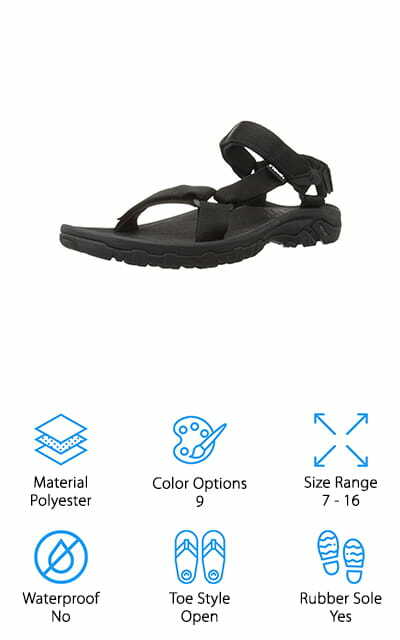 They’re a reliable pair of sandals that have the feel of hiking shoes while still maintaining the look of a true sandal. You can get them in brown or gray and they come in sizes 8 to 13. Our last pick is this pair of sandals from rismart. These are a great pair of closed-toe sandals that feature a high-grade layer of cowhide leather that’s soft and smooth against your skin. They have a really interesting design that features a slightly off-center top strap with an easy-to-use bungee closure at the top front. There’s also a strap that goes around the back of the ankle with a Velcro closure so you can adjust for just the right fit. The rubber sole is durable and skidproof which makes it great for light trails, hiking along the beach, or even wearing to run errands around town. They’re not rated as waterproof but they do dry pretty quickly. Plus, you can choose from 6 different color combinations including brown, navy blue, brown, and grey.